Saudi coalition forces dropped leaflets across the cross-border province of Saada on Friday, urging Yemeni residents to evacuate after officials declared it a military target for widespread airstrikes. The decision followed on the heels of multiple attacks by regional Houthi rebels and a recent coalition declaration to respond more harshly to those attacks. According to reports out of the Associated Press, Saada residents had until sundown to leave. Friday's ultimatum came after Ekhbariya TV reported that Saudi forces had identified the border region as a known Houthi stronghold. The leaflets, dropped by coalition aircraft, stated that all roads would remain open until 7 p.m. local time on Friday, giving citizens the chance to evacuate the city. By Friday evening, as the deadline for evacuations passed, Saudi coalition forces began their first airstrikes on the rebel stronghold. "Our work now is reaching those [Houthis] who planned these attacks and who are hiding in Saada, and the places where the militias are," said coalition spokesman General Ahmed al-Asiri in an interview with the television network this week. "Our military operation will be longer and harsher, and will go after all Houthi commanders." Al Jazeera correspondent Mohamed Vall told the news outlet on Friday that the announcement marked the first time coalition commanders had publicly declared its intentions of seeking out Houthi leadership. In recent weeks, Houthi rebels have crossed a serious diplomatic line by launching attacks on neighboring Saudi border towns. Beginning on Tuesday this week, rocket attacks on the Saudi city of Najran by Shiite rebels in Saada killed eight civilians; on Thursday, rebels fired on the nearby air defense station, according to Al Jazeera reports. "We hope the Houthis will come to their senses and realize the interests of Yemen and the Yemeni people should be the top priority for everyone," said Saudi Foreign Minister Adel al-Jubeir at a news conference with Secretary Kerry late on Friday. The situation on the ground in Yemen has escalated violently since the 2012 ousting of Houthi-backed President Ali Abdullah Saleh. In April, U.N. officials declared that ongoing conflict between the primarily Shiite rebels and recently resigned President Abdu Rabbu Mansour Hadi's government forces would cause the "total collapse" of the Middle Eastern statehttp: . "It's going to be very difficult days ahead," said U.N. envoy Jamal Benomar in a statement to The New York Times in April. At the time, the U.N. had reported some 93 fatalities and injured an additional 364 injuries in the Sanaá, Saada, Dhale, Hudayda and Lahj regions. Lamented Health Ministry official Al-Khadher Laswar, "[Local] ambulances are only used to transport the dead [now]." Houthi spokesman Hamed al-Bokheiti called Friday's aggressive military strikes a "war crime" in a statement, alleging that Saudi forces had taken out a suspected landmine factory, several command centers, and a vital telecommunications hub. In a momentarily hopeful announcement after airstrikes had begun on Friday evening, Secretary Kerry and Jubeir declared a five-day conditional ceasefire to make room for widespread humanitarian efforts, which would begin next week Tuesday at 11 p.m. local time. "The requirements are first and foremost that there is a commitment by the Houthis and their allies ... to abide by this ceasefire," said Jubeir, according to reports out of Reuters. 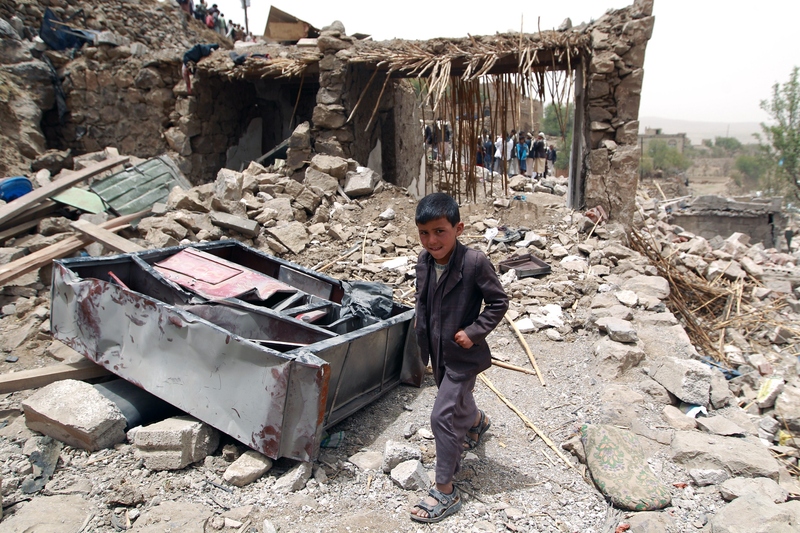 "This ceasefire will apply throughout [all of] Yemen, or nowhere in Yemen." Friday's retaliatory airstrikes came under heavy criticism after some questioned the legality of the coalition's actions. In a Tweet on Friday, the International Committee of the Red Cross indicated that dropping leaflets and warning citizens ahead of time of the coalition's military intentions may not have been enough. "With or without advanced warning," wrote a spokesperson, "direct attacks on civilians and civilian objects are prohibited."